Most of the Americans abroad agree that US expat taxes can be intimidating. The U.S. and Eriteria are the only two countries in the world, which impose taxes on their citizens regardless of their residence. Taxes are already complicated matter, but it’s even more difficult for US expats. They need to comply with 2 different tax systems and also keep an eye on ever-changing US tax laws. Tax situations become more complicated when Americans abroad haven’t been filing for years or have foreign corporations and offshore bank accounts. At 1040 Abroad our mission is to let Americans abroad stop fearing U.S. taxes. We help Americans abroad with their U.S. expat taxes for 6 years now. 1. US taxes on foreign income: who need to file US tax return? Let’s gain an understanding of what the US taxes on foreign income mean to Americans living overseas. First things first, who needs to file a U.S. tax return? Firstly, you are a U.S. citizen or a Green Card holder living abroad. Secondly, your worldwide income is above the filing threshold. By income, we mean wages and salaries for any US and non-US sources, dividends and interests, rental income etc. 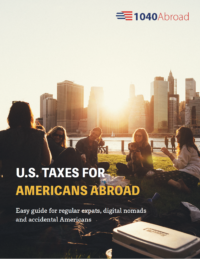 You can check here the tax table for US expats. Self-employed Americans have to file the U.S tax return if their annual income equals $400 or more. Automatic filing extension until June 15th. You do not need to file any form or submit any letter to the IRS as long as you reside overseas. If you are not ready to file before June 15th, then you can file for an additional extension until October 15th. You will need to file and send Form 4868 before June 15th. This form is an Application for Automatic Extension of Time to File U.S. Tax return. The final extension available will push your deadline fo file a US expat tax return to December 15th. To receive one, you will need to send a letter to the IRS explaining why you need the additional two months. You have to do this by October 15th. Tax tip to remember #1: Extensions only apply to your obligation to FILE a tax return. If you owe any tax, you must pay them by April 15th no matter what. Otherwise, penalties and interests will apply. 2. What about tax exemptions for US citizens living abroad? Speaking of owing any US taxes, it’s worth mentioning extensions and exemptions for Americans living overseas. Do you know that most American expats do not owe US taxes? So many people get confused about it! The US has important provisions in place to prevent double taxation. There are several tax exemptions for US citizens living abroad and more. The most popular with self-filing US expats is a Foreign Earned Income Exclusion (FEIE). You file it on Form 2555. While many tax professionals also use the FEIE, the best would also evaluate the Foreign Tax Credit (FTC) which in many instances would be a better option, as it allows carryovers for 10 years forward and the Child Tax Credit. There is also a quite useful Foreign Housing Exclusion. The Child Tax Credit: for each eligible child you can receive up to $2000 credit on your tax owing. And The Additional Child Tax Credit allows you to have any remaining credit refunded. Itemized deductions can be used for medical and dental expenses, taxes, interest, gifts to charities, causality and theft losses, job expenses and certain miscellaneous deductions. Tax tip to remember #2: If you live in a country where tax rates are higher than in the US or your income exceeds the Foreign Earned Income Exclusion, you will benefit claiming Foreign Tax Credit. It’s a dollar-for-dollar credit, which offsets taxes you paid to a foreign country. While many self-filing Americans prefer to use FEIE when filing US expat taxes, we recommend seeking a tax professional consultation to determine the best option for you. Many US expats want to know if there is a US expat tax calculator. We have a free tool for you to check if you qualify for Foreign Earned Income Exclusion and you can find out if you qualify for this exclusion. Tax tip to remember #3: None of the exclusions or credits are automatic. First of all, you need to qualify to use Foreign Earned Income Exclusion. You need to pass the residency test: either Bona Fide Residence Test or Physical Presence test. You also need to file Form 2555 to use Foreign Earned Income Exclusion. If you decide to claim Foreign Tax Credit, then you need to file Form 1116. Tax tip to remember #4: Always track travel time carefully if you want to qualify for a residency test. So for the Physical Presence Test, you need to be in a foreign country for 330 full days. These days do not include the time you traveled to or from the USA, including any type of transport (sea, air, land etc). Americans abroad who need to file US tax returns must have either a Social Security Number or an ITIN. The latter one stands for Individual Tax Identification Number. SSN numbers are valid forever, while ITINs for a dependent or a non-resident alien spouse may require renewals. Let’s talk about FBAR and FATCA. The US government want to know how much money people hide abroad. Thus they introduced the controversial laws of FBAR and FATCA. The first thing to remember: they are not same! FBAR stands for Foreign Bank Account Report and it’s filed on FinCEN Form 114. American abroad needs to file FBAR if the aggregate balance of foreign financial accounts exceeds $10,000 any time during a year. The foreign financial accounts include bank accounts, investments, and pensions. As well as the accounts you don’t own but have a signature authority over. FATCA or Foreign Account Tax Compliant Act is one of the most controversial US tax laws. It is in place to prevent US taxpayers from hiding money in offshore accounts and assets. However, the threshold for filing is much higher than for FBAR and it depends on filing status. For example, if you have more than $200,000 of specified foreign financial assets at the end of the year and you live abroad; or more than $50,000, if you live in the United States. One must report FATCA on Form 8938. Tax tip to remember #5: Filing FATCA (Form 8938) doesn’t cancel your obligation to file FBAR (FinCEN Form 114). And vice versa. There will be hefty penalties applied if the person wilfully ignores FBAR/FATCA filing obligations. You are resident of the state or the state considers you a resident for tax purposes. It happens if you lived in the state at any point during the tax year or your immediate family lives there. You maintain the permanent place of residence in the state or you keep your driver’s license or ID card or voting rights in the states. Find out if you have income in the state. This will determine That includes income earned from working in the state, other income like pension or retirement may be taxable. Also, you will need to check if your state still considers your a resident if you lived outside for more than 6 months. The following states are income tax-free: Alaska, Florida, Nevada, South Dakota, Texas, Washington State, and Wyoming. These states still get revenue through property tax and sales tax. New Hampshire and Tennessee only asses income tax in dividend and interest income. 5. What is a W-9 form and why foreign bank requests it? Have you been requested to fill out this form but you have a vague understanding (or actually have no idea) what it is? Let’s clear it up for you. Form W-9 is used to provide your correct Taxpayer Identification Number and Certification. It’s mostly informational form and it’s not turned over to the IRS itself. Typically, it’s your bank or any US business taking payments to you may request you to complete this form. Tax tip to remember #7: Form W-9 is a part of FATCA compliance. If you are not compliant, you will need to get tax compliant as soon as possible. Bank will transmit your information to the IRS and you do not want to receive a letter from them, do you? Form W-9 is intended to be filled out by US persons. This means that not only U.S. citizens or Green Card holders need to complete it. If an individual chose to be treated as US person for tax purposes, they may also need to fill W-9. US tax laws and rules apply to everyone, who live in the US, works there, married to a US citizen and elected to be taxed as one. As well as entities, such as LLCs, corporations, estates, and trusts which were created under the US law. Do not panic if you need to file late US tax returns as American or Green Card holder abroad. A lot of people start to worry when they realize they have been not compliant for ages. In most cases, you don’t have any reason to be frightened. It’s such a common situation that IRS introduced tax amnesty programs. They are designed to bring US citizens and Green Card holders into compliance in an easy and hassle-free way. We recommend to use is Streamlined Foreign Offshore Program. By the way, don’t fear “offshore” word. Here we have a full blog post debunking myths about the IRS tax amnesty programs. There are no penalties for US expats in this program! However, there are a few requirements to meet to qualify for this amnesty program. You need to have spent at least 1 year abroad out of 3 filing years. And your failure to file was non-willful, meaning you weren’t aware of your tax obligations. Tax tip to remember #6: Streamlined Foreign Offshore Program requires you to submit 3 most recent delinquent federal tax returns. Also 6 years of FBARs (if needed). For example, at the time of writing this article (November 2018), you’d need to file 2015, 2016, 2017. There was another program, Offshore Voluntary Disclosure Program. It was for those taxpayers, who knew about their US tax obligations but haven’t followed through. They possibly could face criminal liability and/or civil penalties. However, the IRS has closed this program in September 2018. Trump’s tax reform affected owning a Controlled Foreign Corporation. Now it means that all income is Subpart А income. But it’s not just that. All currently untaxed retained earnings will be subject to a one-time tax. First, what is a Controlled Foreign Corporation? It is a U.S. corporation which operates abroad with U.S. shareholders who have more than 50% of the control. What does “foreign” mean in the context of business incorporation? The IRS considers only non-U.S. companies and companies which are taxed as corporations (including LLCs that elect to be taxed as a corporation) for the purpose of CFC status. If you own a Controlled Foreign Corporation, then you must file an annual report on IRS Form 5471 – Information Return of U.S. Persons With Respect to Certain Foreign Corporations. You will need to submit info regarding U.S. citizens who are shareholders, director, and officers; a listing of all U.S. shareholders and their stocks; CFC’s classes of stock and shares outstanding; a balance sheet and income statement for the tax year. The corporation should file this form. Each U.S. shareholder, director, or officers who meet the 50% criterion will need to file a separate report. This report will include each U.S. person’s income in dividends, investments and other income from the foreign corporation. This document is a Summary of Shareholder’s Income from Foreign Corporation. FATCA and other burdensome tax reporting requirements make US expat’s life complicated. If you think renouncing US citizenship is an easy way out of the US tax system, it’s not true. No wonder the renunciation rate is rising year by year. Besides complicated tax process surrounding the process itself, there is a $2,350 fee to renounce U.S. citizenship on top of all. Read more our full guide to renouncing U.S. citizenship here. You might need to file U.S. state tax return depending on your state. Don’t forget about FBAR and FATCA requirements. If you fail to report the required forms, the penalties will be applied. Form W-9 is used to provide your correct Taxpayer Identification Number and Certification. This form is filled out as part of FATCA. Trump’s tax reform has changed the game for those Americans, who own Controlled Foreign Corporations. Renouncing U.S. citizenship doesn’t automatically cancel your U.S. tax obligations. We try to make US expat taxes easy for everyone. We believe taxes shouldn’t be your headache. Contact us if you want to receive a free 20-min phone consultation.